After over a decade together, Flipping Out stars Jeff Lewis and Gage Edward have split up. The couple shares two-year-old daughter Monroe, which prompted Jeff to refer to himself as a “single dad” when he made the announcement. Instagram Roundup: Kathryn Dennis, Lindsay Lohan, Danielle Staub, & More! The Real Housewives were all about that mother/daughter time this past week. Real Housewives of New Jersey OG Teresa Giudice celebrated her daughter Gia Giudice’s eighteenth birthday! Yes, you read that correctly. Gia Giudice is eighteen years old. How old do you feel now? Personally, I’m feeling ancient right about now. Meanwhile, Teresa’s costar Danielle Staub went to a play with her daughter Jillian Staub. Additionally, Kyle Richards posed for a mother/daughter photo with Sophia Umansky. Then, Vicki Gunvalson got her daughter Briana Culberson to wear matching pajamas on a cruise. RELATED: Instagram Roundup: Teresa Giudice, Stassi Schroeder, Andy Cohen, Craig Conover, & More! Then, there were some sweet son photos as well. Bachelor alum Sean Lowe hit the beach with his sons Samuel and Isaiah in Hawaii. Also, Dallas Housewife Stephanie Hollman shared a photo with her. Scott Disick posted a photo cuddling with his youngest son Reign. In other reality star updates, braces are all the rage these days. Kelly Dodd and her ex Michael Dodd took their daughter Jolie to get braces. Yes, they even marked the occasion with a family photo. Which, is actually pretty sweet. 90 Day Fiance alum Anfisa Nava showed off her new braces. Stassi Schroeder, Erika Jayne, Kathryn Dennis, and Bethenny Frankel, struck a pose and showed off some chic outfits. Then there are other reality stars who cropped out their outfits and went for the selfies. Luann de Lesseps, D’Andra Simmons, LeeAnne Locken all posted selfies this week. And of course, as per usual, there were plenty of reality star couple photos on Instagram. Margaret Josephs and husband Joe Benigno went to Miami. Cynthia Bailey and Kandi Burruss posed for a couples selfie with their men Mike Hill and Todd Tucker. RELATED: Instagram Roundup: Reza Farahan, Lisa Vanderpump, Captain Lee Rosbach, & More! Click through the photo gallery below to see all of those pictures and more from this week’s Instagram Roundup. TELL US- WHAT ARE YOUR FAVORITE PHOTOS FROM THIS EDITION OF INSTAGRAM ROUNDUP? WHICH REALITY STARS DO YOU WANT TO SEE MORE PHOTOS OF? DO YOU WANT TO SEE MORE REALITY STAR KIDS ON THEIR SHOWS? Reality Star Christmas Photos- Dorinda Medley, Scheana Marie, Jennifer Aydin, & More! Even though they’ve publicly feuded, many reality TV stars gathered with family for Christmas. Teresa Giudice, Melissa Gorga, and Joe Gorga celebrated Christmas Eve together. But what kind of cookies did they eat? Did Melissa bring some sprinkle cookies? Or did Teresa insist on eating pignoli cookies? Hopefully, they didn’t argue about desserts this year. After years of public tension, it seems like sisters Kyle Richards, Kim Richards, and Kathy Hilton are in a great place. They spent Christmas together as well. Even though she’s on the outs with her stepchildren, Caitlyn Jenner went to Kim Kardashian’s Christmas party. Kylie Jenner and Khloe Kardashian wore matching outfits with their daughters. Kyle Richards, and Faye Resnick, joined old friend Kris Jenner for a group photo. RELATED: Thanksgiving Instagram Roundup- Teresa Giudice, Marlo Hampton, JWOWW, Lala Kent, & More! As expected, plenty of reality TV stars wore matching Christmas pajamas. Bristol Palin coordinated pajamas with her kids. Additionally, Kameron Westcott and Teddi Mellencamp Arroyave took part in the social media Christmas tradition as well. Stassi Schroeder took her man Beau Clark to her hometown, New Orleans. Jax Taylor visited Brittany Cartwright’s family in Kentucky. California native Scheana Marie spent time with her family, which did include some matching pajamas. Other reality stars celebrated their last Christmas before adding to their family. For instance, Porsha Williams, Paola Mayfield, and Lauren Burnham showed off their baby bumps. Jersey Shore stars Nicole “Snooki” Polizzi and Deena Nicole Cortese shared baby bump pictures as well. Bethenny Frankel went Instagram official with Paul Bernon in the Dominican Republic. Meanwhile, Cynthia Bailey shared an airplane selfie with her man Mike Hill. Dolores Catania was just happy to have both of her kids back in the Garden State. And Dorinda Medley enjoyed celebrating with her daughter Hannah. Check out those pictures and more by clicking through the photo gallery below. TELL US- WHAT DO YOU THINK ABOUT THESE REALITY TV STAR CHRISTMAS PHOTOS? ARE YOU A FAN OF THE MATCHING PAJAMAS TREND? OR ARE YOU OVER IT? Andy Cohen and Anderson Cooper’s AC2 show was the place to be for Bravolebrities. 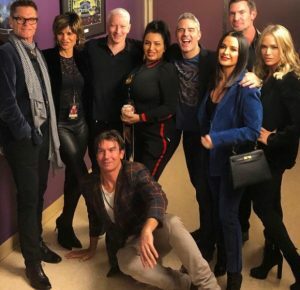 Real Housewives of Beverly Hills cast members Kyle Richards, Teddi Mellencamp Arroyave, and Lisa Rinna checked out the show. Lisa’s husband Harry Hamlin even came with. Shahs of Sunset star Mercedes “MJ” Javid went. 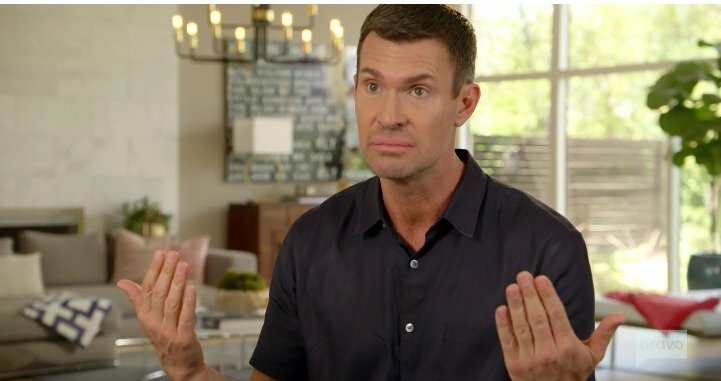 Flipping Out star Jeff Lewis was there, which is very interesting since he’s been very public about the end of his Bravo contract. Oh and he read Andy’s text messages out loud during his radio show. Of course, Bravo super fan/ (possibly former Bravolebrity) Jerry O’Connell was in the group photo as well. Is his show Bravo’s Play by Play ever coming back? 90 Day Fiance fiance stars Ashley Martson, Molly Hopkins, David Toborowsky, and Annie Suwan posted selfies. New mom Olga Koshimbetova shared a photo holding her son Richie. Black Ink Crew stars Young Bae and Melody Mitchell shared some solo pics. Southern Charm OG cast members Cameran Eubanks, Shep Rose, and Craig Conover spent some quality time together. Craig’s ex-girlfriend Naomie Olindo and her boyfriend Metul Shah posed with their matching slippers in the liquor store. Relationship goals? Meanwhile, former enemies turned friends, Patricia Altschul and Kathryn Dennis killed it in a selfie. New Jersey Housewives Melissa Gorga, Margaret Josephs, and Jackie Goldschneider enjoyed a girls night out, making their allegiances clear. The Real Housewives of New Jersey OG Teresa Giudice attended her oldest daughter Gia Giudice’s cheer banquet. Upcoming star of The Bachelor Colton Underwood has returned to posting on social media now that filming for his season is over. In other franchise sightings, former lead of The Bachelorette JoJo Fletcher shared a cute photo with fiance Jordan Rodgers. Real Housewives of Beverly Hills alum Brandi Glanville sparked rumors that Orange County Housewife Kelly Dodd will join RHOBH with her Instagram caption? Can’t we just keep Kelly on RHOC and get a Brandi comeback in the 90210 instead? Shahs of Sunset star Golnesa “GG” Gharachedaghi shared a solo shot rocking some lingerie. In contrast, her costar Mike Shouhed shared a selfie from the dentist’s chair. Hopefully, that does not become a trend. Click through the gallery below to see all of those photos and more from our latest Instagram Roundup. TELL US- WHICH PHOTOS ARE YOUR FAVORITE FROM THIS WEEK’S EDITION OF INSTAGRAM ROUNDUP? WHICH REALITY TV STARS SHOULD POST MORE OFTEN? Instagram Roundup: Reza Farahan, Lisa Vanderpump, Captain Lee, & More! All eyes are on Lisa Vanderpump these days. If you’re searching for her, don’t look anywhere near the Beverly Hills Housewives. She’s not hanging out with any of them these days, but she does spend time with some beloved animals. Recently, she shared a photo of herself holding a giant bunny. Flipping Out cast member Jenni Pulos posted a photo of herself and her new puppy named Jax. She did not specify if she named him after Vanderpump Rules star Jax Taylor, but that’s the first “Jax” that popped up in my mind. Instagram Roundup: Vicki Gunvalson, Sandy Yawn, Nicole Nafziger, Andy Cohen, & More! 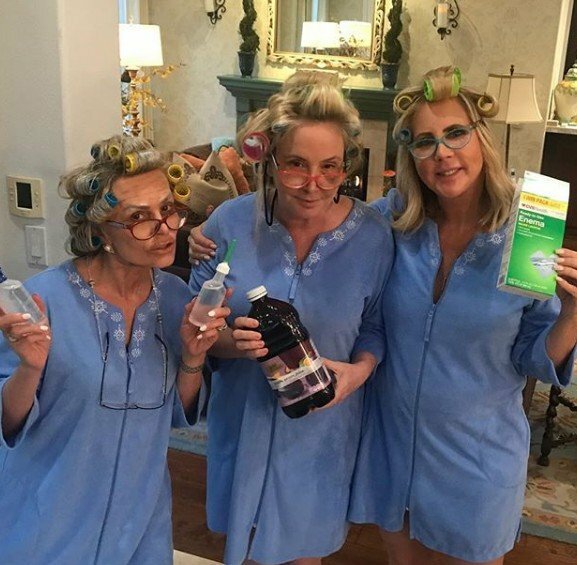 Orange County Housewives Tamra Judge, Shannon Beador, and Vicki Gunvalson dressed up as “old ladies” on the last episode and shared a behind-the-scenes photo on Instagram. Atlanta Housewife Porsha Williams and 90 Day Fiance cast member Elizabeth Potthast showed off their growing baby bumps. Beverly Hills Housewives Kyle Richards, Lisa Rinna, Erika Jayne, Dorit Kemsley, and Teddi Mellencamp Arroyave shared photos from the cast trip in France. Lisa Vanderpump was not present. Obviously. RELATED: Instagram Roundup: Stephanie Hollman, Kelly Dodd, Chelsea Meissner, DJ Pauly D, & More! Andy Cohen united Mariah Carey and Sandra Bernhard while filming his radio show. Khloe Kardashian, James Kennedy, Kristen Doute, Stassi Schroeder, Katie Maloney, Brie Bella, and Nikki Bella all shared photos from the People’s Choice Awards. RELATED: Instagram Roundup: Cameran Eubanks, Katie Maloney, Vicki Gunvalson, & More! Check out all of those photos and more from this week’s Instagram Roundup in the gallery below. First, before we get to tonight’s Flipping Out recap, a question: Do you have a client, friend or family member who gives you so much anxiety and a high-stress level just at the thought that you have to spend time with them? That’s me and Flipping Out. Maybe I need a glass of wine, a box of chocolate, a comfy blanket and an anxiety pill all before I start recapping this show. Or maybe all of the above. I seriously don’t know how anybody works with this man. On to the show: Jeff Lewis and his crew are traveling to High Point, North Carolina to set up a showroom at a home goods show. Jeff is stressed because they are already late to the airport and Jenni Pulos can’t find her phone. Jeff is pissed and says that she does this all the time.